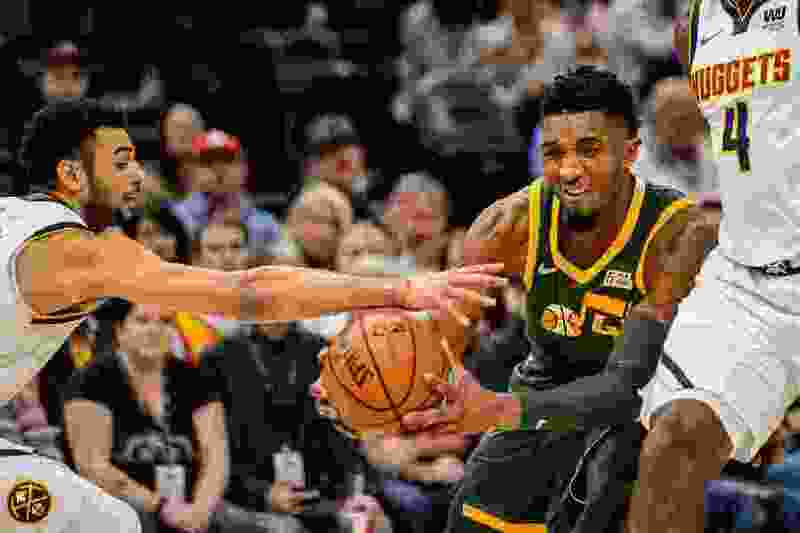 (Trent Nelson | The Salt Lake Tribune) Denver Nuggets guard Jamal Murray (27) reaches in on Utah Jazz guard Donovan Mitchell (45) as the Utah Jazz host the Denver Nuggets, NBA basketball in Salt Lake City on Wednesday Jan. 23, 2019. Jazz guard Donovan Mitchell revealed earlier this month that he declined the opportunity to defend his Slam Dunk Contest title because he found the experience too draining, and he would rather conserve his energy for the regular-season stretch run. Turns out, he might still be participating in All-Star Weekend, though. On Tuesday night, it was revealed that Mitchell was selected to participate in the Rising Stars Challenge, which features rookies and second-year players in a USA vs. World format. Mitchell was one of 10 players named to the U.S. team, along with former University of Utah star and now-Los Angeles Lakers forward Kyle Kuzma; Kuzma’s L.A. teammate Lonzo Ball; the Celtics’ Jayson Tatum; the Kings' De’Aaron Fox and Marvin Bagley; Atlanta’s Trae Young and John Collins; Brooklyn’s Jarrett Allen; and Memphis’ Jaren Jackson. The World Team will feature Mavs rookie sensation Luka Doncic; 76ers point guard and reigning Rookie of the Year Ben Simmons; the No. 1 pick of the 2018 draft, Phoenix’s DeAndre Ayton; Toronto’s OG Anunoby; the Clippers' Shai Gilgeous-Alexander; the Kings' Bogdan Bogdanovic; the Bulls' Lauri Markkanen; the Nets' Rodions Kurics; the Wolves' Josh Okogie; and the Cavaliers' Cedi Osman. The game will be played at 7 p.m. MT on Feb. 15 in Charlotte and will be broadcast on TNT. Mitchell participated in the event as a rookie last season and totaled seven points and seven assists. Mitchell leads all first- and second-year players in scoring this season, averaging 22.5 points per game. He is also averaging 4.0 assists, 3.8 rebounds, and 1.6 steals per game. That said, he never specifically said he definitely wouldn’t play in the Rising Stars Challenge. While Mitchell declined to speak to the media Tuesday at practice before the team left for Portland, coach Quin Snyder said the team would support Mitchell’s decision on the game, whatever it turns out to be.